I love making cultured (also known as lacto-fermented) foods. After taking about 6 months off from fermenting (save a battle with 20 heads of cabbage that resulted in 7 gallons of kraut), I'm back at it. 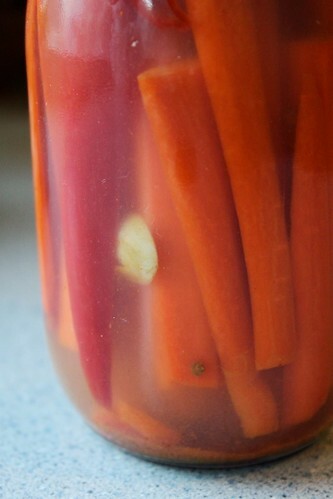 Last week I made some lovely Cultured Curried Carrot Sticks, and now I've been bit hard by the fermentation bug. Cultured and lacto-fermented foods - such as sauerkraut, fermented vegetables, yogurt, miso, kombucha, and kvass - are rich in probiotic bacteria, enzymes, and amino acids. These foods aid digestion, increase immunity, and help alkalize the body. While everyone can benefit from consuming fermented cultured foods, they are especially beneficial if you are recovering from chronic illness, allergies, yeast infections, or have taken antibiotics recently. Many natural grocery stores and co-ops offer wonderful cultured and fermented foods, but they are often costly. I prefer to make most of mine at home - it is simple and much more affordable! These cultured carrot sticks can easily be made year-round. Make them now using sweet and tender young carrots from the spring garden, and use larger carrots as the summer goes on and as summer wanes to fall. If you can store carrots in cold storage for winter, or actually get local carrots through the colder months, you're in luck, and can make this even when the snowflakes start to fly! But if I were you, I'd make lots of jars through spring, summer, and fall, and take the winter off and rely on your stash. 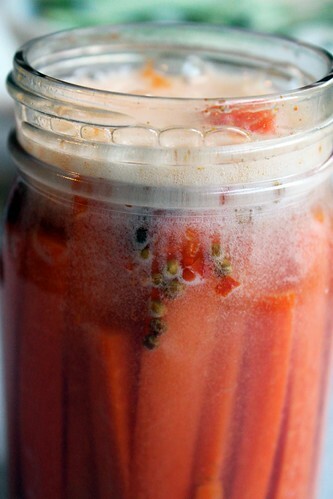 Jars of cultured carrots will last 6-8 months when kept in cold storage! And besides, the longer they sit, the better they taste; cultured foods age like fine wines. I took a few jars of these carrot sticks to the second MPLS Swappers food swap over the past weekend (if you want to read more about the MPLS Swappers, check out our blog). I organize this event with my friends A-K and Mandy, and it was a big success once again! All my jars of carrots were swapped in no time. Thankfully, I reserved a couple of jars at home for myself and let them ferment a few days longer, to get nice and sour the way I like them. And when I opened that jar after 7 days, those carrots bubbled. It's aliiiiiiive, ha ha ha ha ha! These carrot sticks are slightly sour, slightly salty, slightly spicy, and plenty crunchy. They have a beautiful bright orange color, due in part to the addition of curry powder. Serve along side sandwiches or wraps, Indian-style meals, as part of a relish tray, or eat straight out of the jar. Cultured carrot sticks can also be finely chopped and added to relishes, salsas, or chutneys for a healthful probiotic kick. Metal reacts with fermented foods, so remove carrot sticks from jars with wood or plastic utensils and serve in non-metallic bowls/trays. Heat a small heavy bottomed sauté pan over medium heat. Add the coriander seeds and lightly toast, stirring often, until they are golden and fragrant. Remove from heat and place in a small bowl to cool. Slice carrots into 3-4 inch lengths about 1/4-inch x 1/4-inch. prepare other vegetables as directed. Thinly slice one of the halved cayenne peppers cross-wise. Add 1 sliced garlic clove, 1/2 tsp coriander seeds, 5 cardamom seeds, 1/4 tsp curry powder, 1 Tbsp whey, and 1 1/2 tsp salt to jar. Then tightly pack with carrot sticks and one of the cayenne pepper halves. Sprinkle with a few slices of cayenne pepper. Then fill with water within 1 inch of the top. Add 2 sliced garlic cloves, 1 tsp coriander seeds, 10 cardamom seeds, 1/2 tsp curry powder, 2 Tbsp whey, and 3 tsp salt to jar. Then tightly pack with carrot sticks and two of the cayenne pepper halves. Sprinkle with a few slices of cayenne pepper. Then fill with water within 1 inch of the top. Tightly close jars, and shake lightly to distribute ingredients and dissolve salt. Then place jars in a tray and set on the counter at room temperature for 4-7 days. Try them at 4 days and see if you want them to be more sour or not, to get them more sour and softer leave them out at room temperature longer. While I enjoyed them at 4 days (they were very crunchy and a little tart/sour), I liked them best after 7 days (softer but still crunchy and more intensely sour). If you let them sit for 7 days, they will bubble quite a bit when you open them - that's live food, friends! 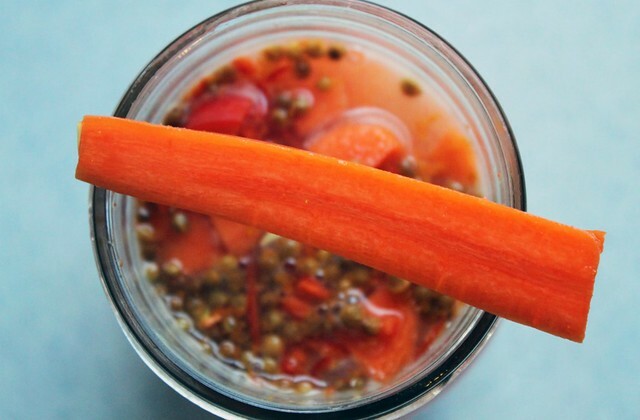 In warmer weather, your carrots will ferment more quickly, so be sure to check in on them periodically. After fermenting at room temperature, keep in your fridge. If you can, wait a week or two before eating them - the flavor will intensify. The longer they sit, the better they are! Like all ferments, these will last for 6-8 months when kept in cold storage. Whey is the watery liquid remaining after milk has been curdled (yogurt) and strained. 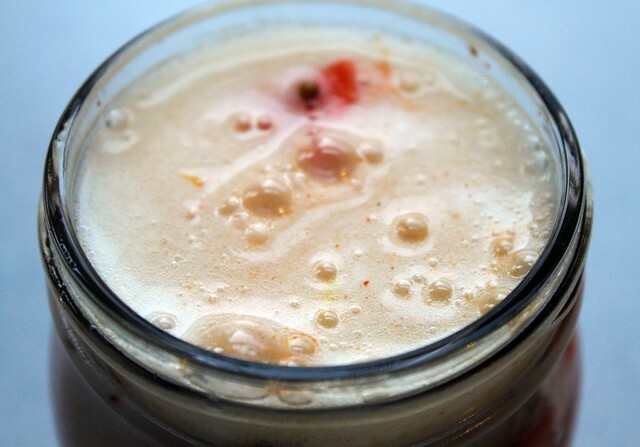 Full of enzymes, probiotic bacteria, vitamins, and minerals, whey can be used for making fermented foods and beverages, and is also a healthful drink on its own. Whey can be made easily at home by straining yogurt. Strained yogurt is thick, rich, and creamy, and has a more intense flavor than unstrained yogurt. To strain yogurt, I generally line a medium sized fine mesh strainer with cheesecloth or a large coffee filter, place it on top of a bowl, and put 2-4 cups of yogurt in the lined strainer. I cover lightly with a towel and let strain for 12-24 hours. You can do it on the counter, or you can put it in the fridge. The site Wonderful Ingredients also offers up two good methods for straining yogurt. If you are intolerant to lactose, whey is probably not a good choice for you. Some individuals who are casein sensitive may be able to tolerate whey, but cross contamination is highly likely. So, if you are intolerant or don't have whey (or plain yogurt) on hand, you can make this recipe without whey with success. Simply omit the whey and double the amount of sea salt - the increased quantity of salt will help preserve the carrots and stave off unfriendly bacteria in the whey's absence.